Unsightly cracks and large joints in your concrete are not only an eye sore, they can often lead to further damage to your concrete. Luckily there is a solution that not only can improve the appearance of your concrete but can also prevent further cracking or sinking. Exposed joints and cracks, if left unsealed, can allow water, ice and other debris to penetrate deep below the concrete slabs. This can lead to drastic expansion and undermining of the subsoil resulting in cracked and unlevel slabs. A simple solution to avoid these harsh concrete situations is to seal your existing joints and cracks. 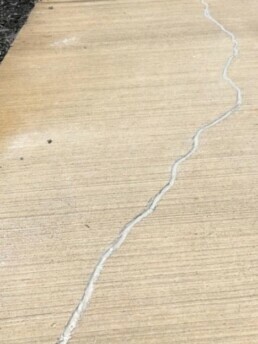 Joint sealing can enhance the appearance of your driveway or sidewalk. Once joints and cracks are sealed, no debris can enter into them which means finally, no more stubborn weeds popping up in these areas! With the array of colors offered, finding the right match for your concrete should be a breeze. We believe in using high quality products from local vendors for our customers. For that reason, we use Pecora DynaTrol II which is a general purpose, two part polyurethane sealant. We mix the two part system fresh on each job site, every time. 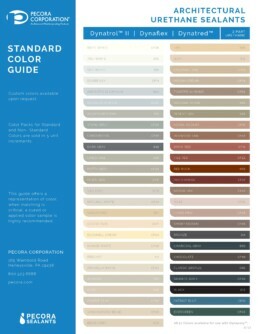 Appearance of the joint(s) is just as important as functionality and for that there are a multitude of colors to help match the color of your existing concrete (see color chart to the right). 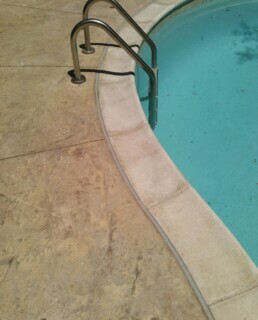 Concrete joint sealing is a process that can save you lots of time (as well as money!) and prevent plenty of headaches down the line. Remember, taking action today will improve your chances of finding a feasible solution to your concrete-repair problem. Don’t hesitate to contact us here at Detroit Concrete Leveling. We specialize in this line of work and know how to handle any assignment –– no matter how big or small. Call now at (866) 472-9033 and let us help you today!